A good coach is always in demand and over 30 end of contract late-model coaches with low mileage will be auctioned starting from just $1. 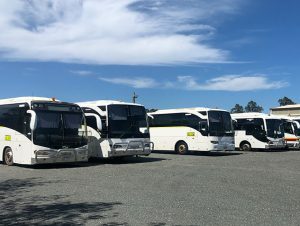 In an extremely rare event, an end of contract fleet of over 30 coaches and buses are going up for auction at Lloyds Auctions where if a bus is purchased by a sports team the bus will be sign written in their team colours along with 2 free memberships to their favourite Australian football team with every bus purchased. With coaches and buses ranging from 12 seaters to 50 seaters, there are buses to suit all requirements. “This fleet of vehicles are in great condition, perfect for sporting teams, local schools, community run-abouts, people in the travel industry or even someone with the intention to start up their own business opportunity,” said Mr. Lee Hames, Chief Operations Officer at Lloyds Auctions. “In fact, we think that these buses are such a great opportunity for sports teams that if a sports team does purchases one of these coaches or buses, we will sign write it for them in their team colours,” Mr. Hames continued. This fleet of buses and coaches have been looked after and well-maintained by a local reputable South East coach company and the vehicles have low mileage. The vehicles on offer range from people movers, mini buses, tour coaches right up to tri-axle long range coaches. With over 30 buses on offer there will be something to suit everyone’s needs. “This is a rare opportunity for people in this industry so for every bus purchased the winning bidder will receive 2 free memberships to their favourite Australian professional football team,” Mr. Hames said.